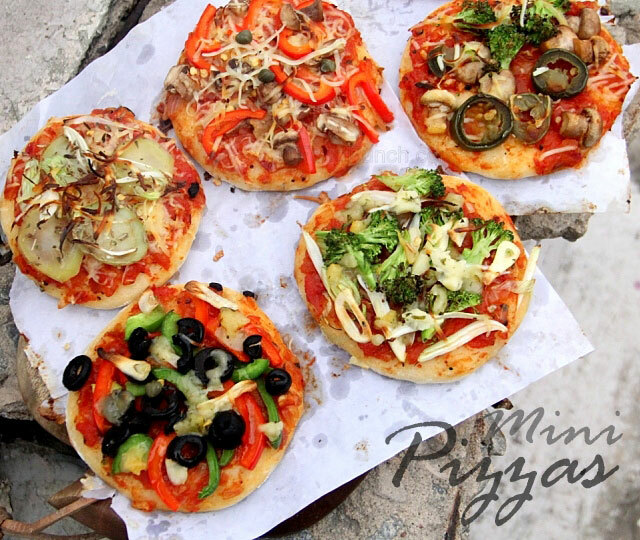 Healthy, homemade, fresh, hand tossed mini pizzas with the topping of your own choice. Pizzas spell absolute indulgence and I hardly know anyone who can say ‘I don’t like pizzas’. Yet there are many like us who refrain from this delicious temptation such is the predicament of someone who needs to eat healthy. 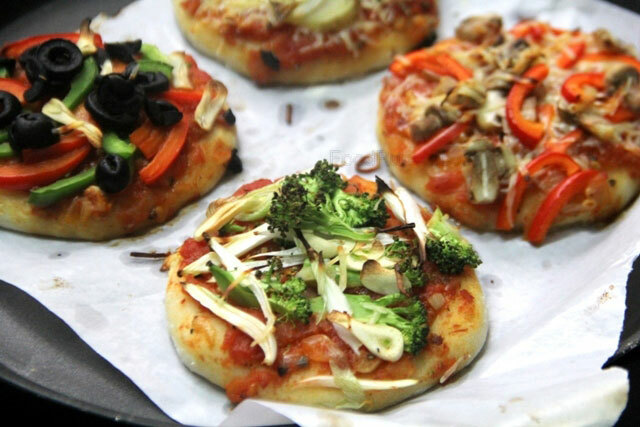 So what do we do, give up on them, nay instead do it yourself and try this healthy pizza recipe. It obviously goes without saying that mini pizzas are super convenient at home and also great to be served for parties. 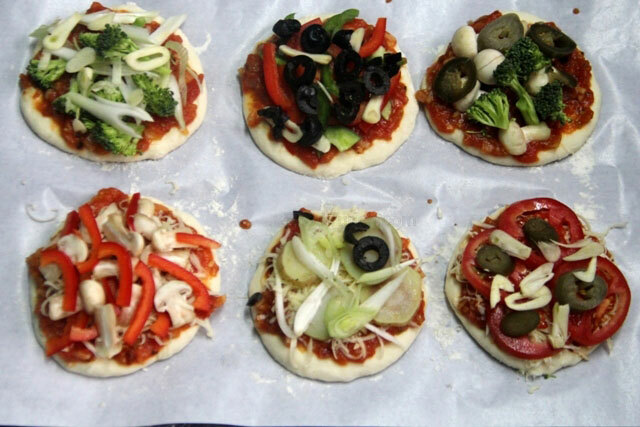 But toady they also turned out an awesome choice for the variety of toppings that I could add to the mini pizzas. I mean a different topping of choice over each pizza, infact I totally skipped the cheese layer on my pizzas and choose all my healthy toppings, while loaded Mr. H’s pizzas with mozzarella and his fav potato topping. 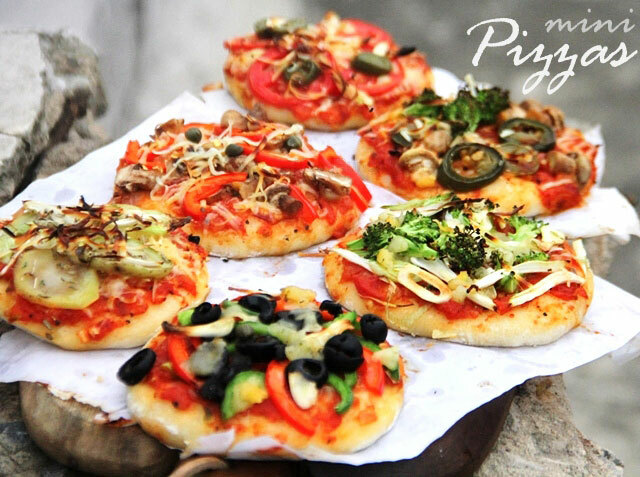 Life couldn’t get better than this, a freshly baked, homemade, hand tossed pizza with the topping of your choice, these mini healthy pizza recipe can deliver it all. 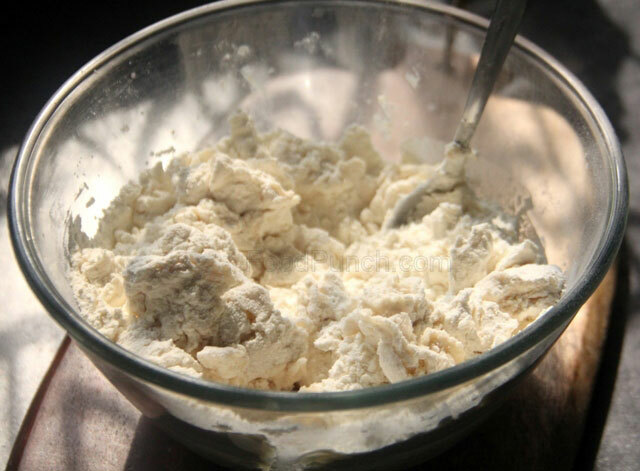 In a deep mixing bowl add yeast and pour lukewarm water over it, leave on for 5-10 mins until frothy. Then add flour and salt and fold until the dough come together. 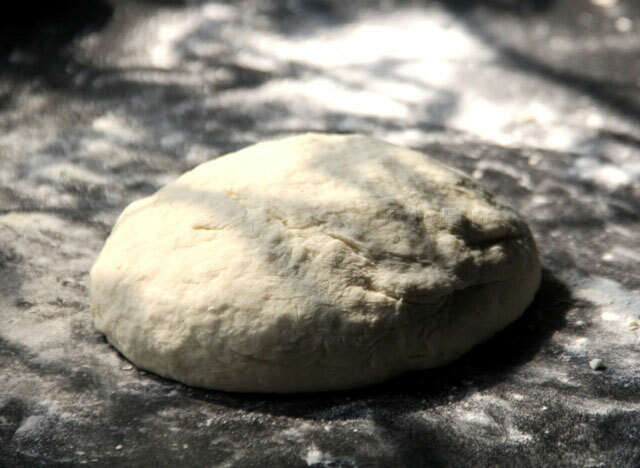 The tip out onto a generously dusted work surface and knead into a smooth dough. Add some extra plain flour if the dough sticks to your fingers. Now brush the inside of the bowl with some olive oil and pace the kneaded dough into add, add half the remaining olive oil into the dough and knead it briefly to incorporate the oil. Finally slather the remaining oil on the top of the dough. Cover with a damp cloth or plastic wrap and leave in a warm, damp place for 2-3 hours or until the dough doubles up. 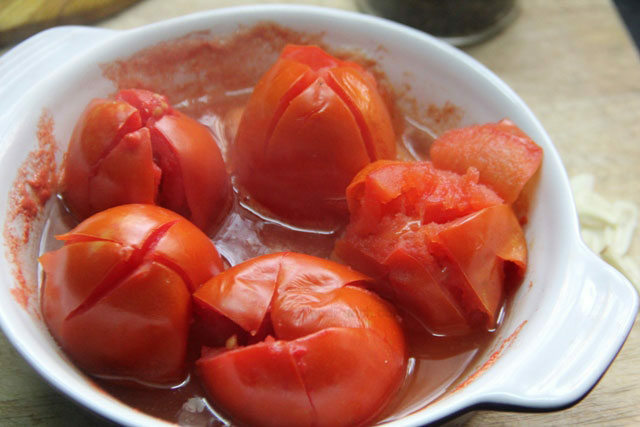 Remove the pits of the tomatoes, make cross slits on the base of each tomato and keep it in a deep pan or bowl, add ½ cup of water and let it boil on a low heat or use the microwave, until the skin separates and tomatoes soften. 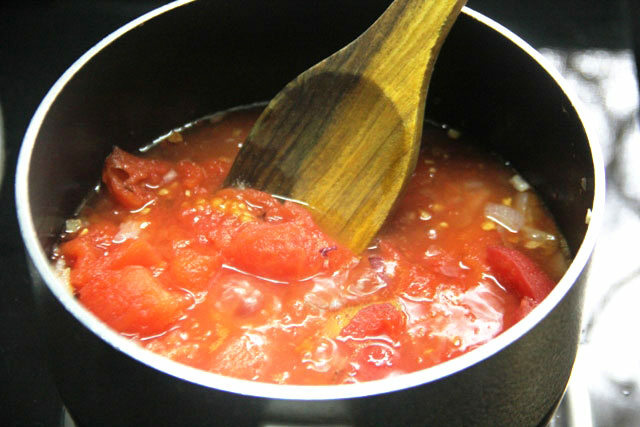 Carefully peel off the skin and discard, mash the tomatoes slightly with a spatula. 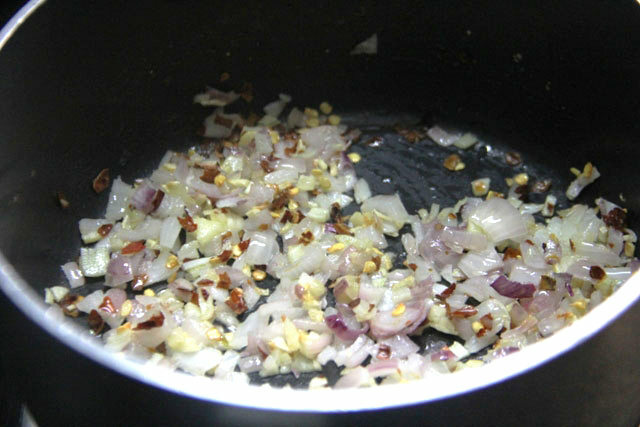 Now heat the 1 & ½ tsp olive oil in a sauce pan, add the garlic and onion and let them sizzle until just translucent. 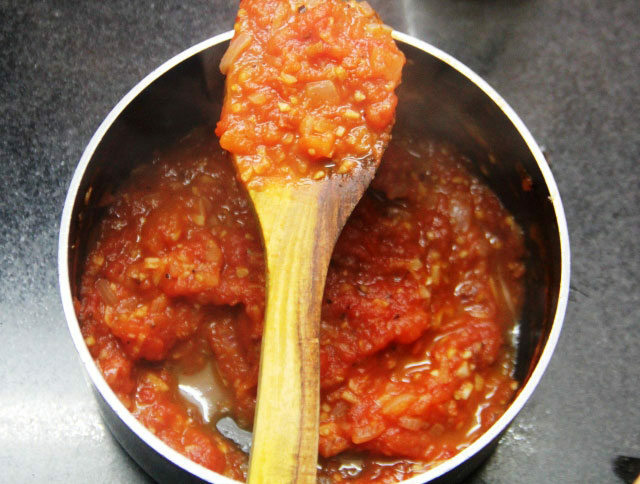 Then add red chilli flakes followed by the blanched tomatoes along with all the liquid..
Bring to a boil and then simmer cook until the sauce reduces t a thick spreadable consistency, stirring and mashing with a spatula occasionally. Dress with salt to taste and mix the oregano and set aside. Preheat the oven to 300OC. Dice up the vegetables and keep aside. 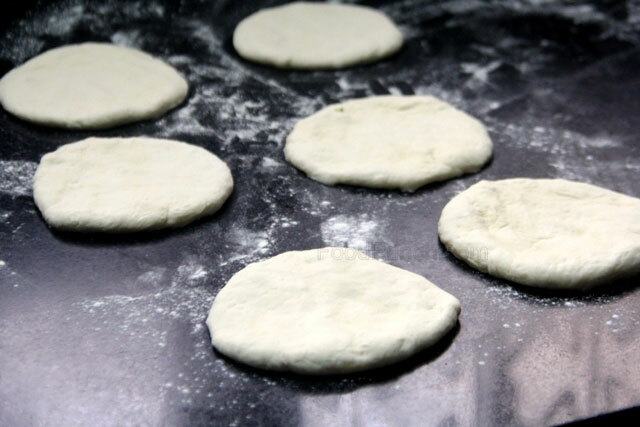 Divide the dough into 8-10 rounds, dust the work surface lightly and flatten each dough ball in to a flat base of the thickness as you prefer. I flatten each out to aprox 0.4 inches, then transfer each onto the baking tray lined with parchment paper. 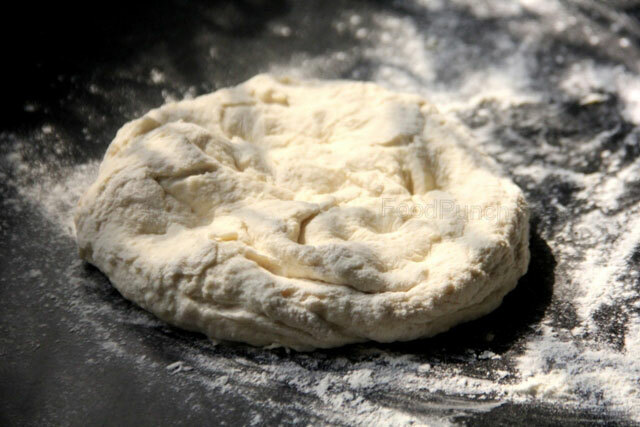 Or you may use a rolling pin dusted with flour to roll out the dough into a base. 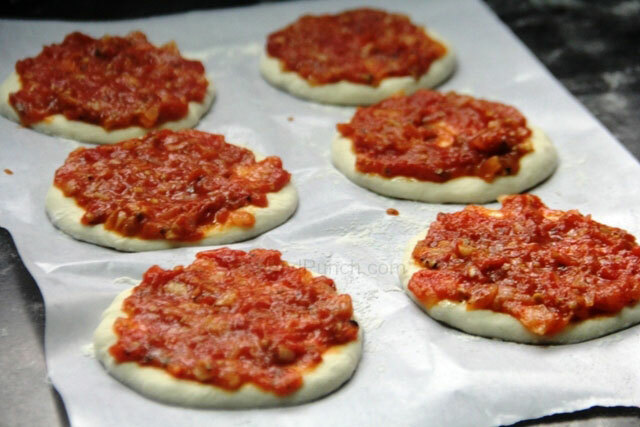 Now slather a tbsp of the prepared tomato sauce over each pizza base, follow up with a layer of grated cheese (avoid cheese for the ones that you wish to sprinkle goat cheese at the end). 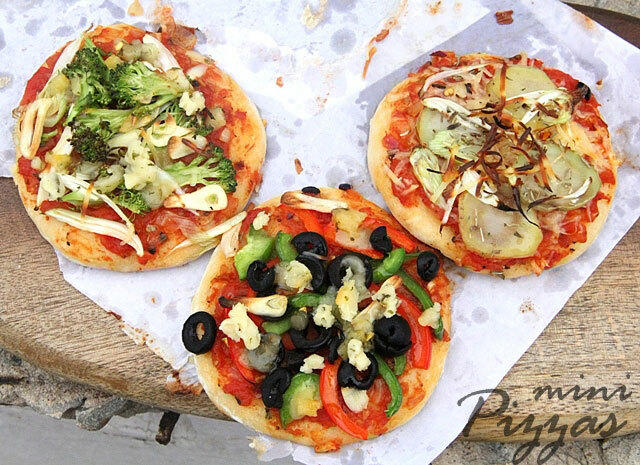 Then arrange the topping of your choice over each pizza base, you may make one common topping or make different for all, like I did. 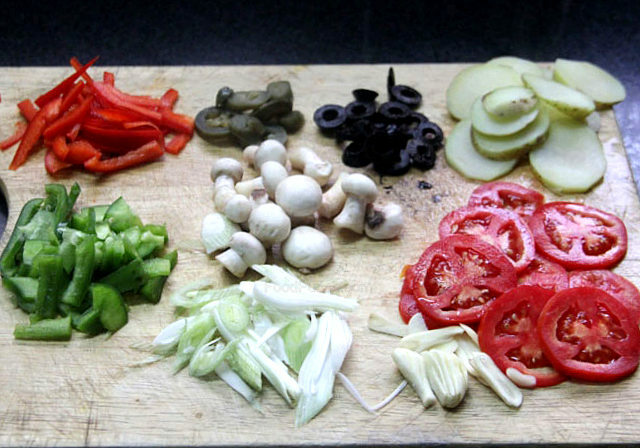 Potato, garlic flakes, spring onion with rosemary for one, all pepper for second, mushroom and pepper for the third, broccoli and garlic for the other, pepper and black olives for one, tomato and jalapeno in one, and all mixed for the other. Just top it as you like. Sprinkle a little salt and extra cheese if you like on top of each and bake for 12-15 mins, until the base is slightly golden on the edges. Remove from the oven and drizzle a little extra virgin olive oil over the pizzas. Then finally top up with some crumbled goats cheese of your choice, chilli flakes and the oregano pizza dressing as you like and serve immediately. Get ready for all the compliments and just say Bon appétit! Goes without saying, choose the topping of your own choice. Add extra cheese to your own liking. 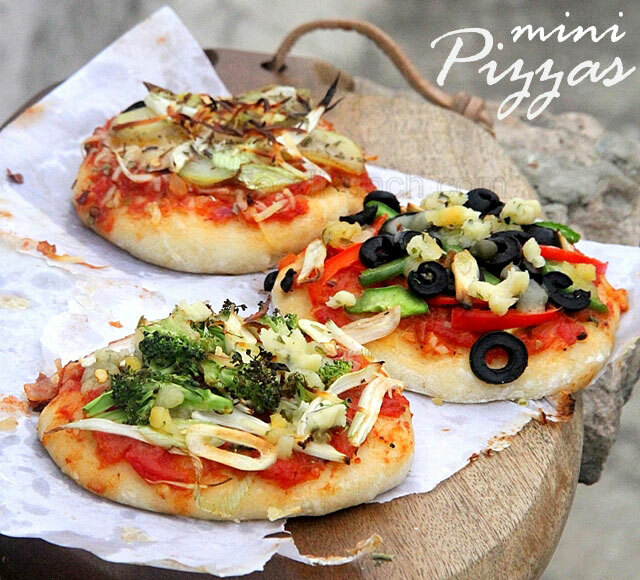 Instead of making many mini pizzas you may instead just make one large pizza, toss out one large 12 inch base, top up with sauce and toppings and bake. The baking a large one may take 5-10 mins longer. 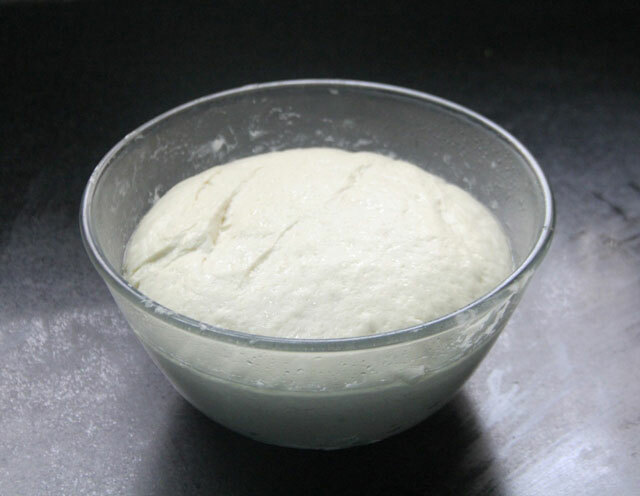 The pizza dough can be prepared a day in advance. Once it has doubles, keep it in an airtight container in the fridge and then take it out from the refrigerator about an hour before ready to bake. I have used this recipe several times. It is a big succes when entertaining. Guests think it is very funny to “make their own food” and gets the conversation flowing. Kids love to make their own favorite pizza.